Versatile and comfortable, the 2017 Honda Accord gives drivers of Los Angeles a spacious cabin that’s loaded with intelligent and plush interior features. You’ll love the smart infotainment system programmed into a touchscreen display where you can stream your favorite audio through a high-quality sound system, and the power adjustable seats were designed to give you the perfect settings and support to make long drives comfortable. Find out more below before coming in from Inglewood or Santa Monica for a test drive today! Get just the right amount of support by adjusting your seat in a number of ways with power lumbar support to make long drives easier. Chilly days are made much more cozy when you flip on the heated seats to keep you and your passenger warm without blasting the heat. 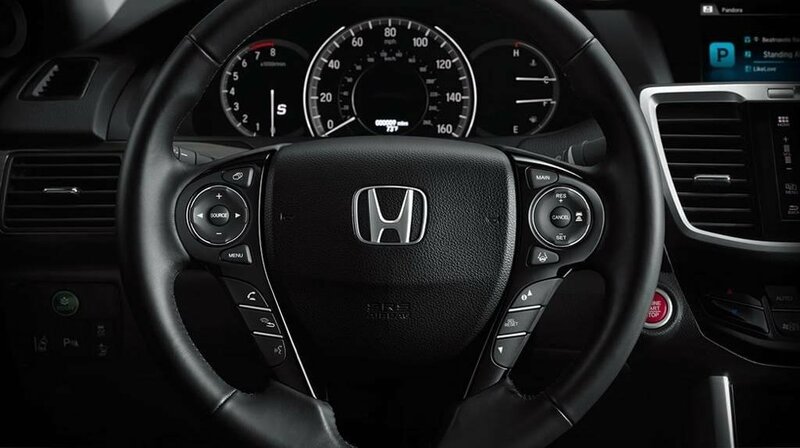 Enjoy crystal clear sound quality through the premium sound system inside of the new Honda Accord for much more fun to stream your favorite songs. Sophistication and the ultimate comfort are available to you with these plush leather seats and a leather-wrapped steering wheel and gear shift knob. Make the most of every commute or weekend outing inside of the 2017 Honda Accord. Easy to finance, this midsize sedan offers a generous amount of cargo space with a trunk area of 15.8 cu. ft. to bring along everything you need. A dual-zone automatic climate control system helps keep you comfortable by letting you and your passenger elect your own individual temperature settings. Push Button Start lets you ignite the engine with a button located right next to the steering wheel rather than digging for your keys. Bluetooth technology lets you make hands-free phone calls with steering wheel-mounted controls and also stream audio through your phone. To schedule a test drive with the 2017 Honda Accord, give us a call at (888) 381-0444 and speak with a sales specialist. You can also meet us at the showroom, located at 5850 West Centinela Ave in Los Angeles. For any questions you may have, you can also leave a message online to have us reach out to you soon!